A Gubernatorial Florida Election will be November 6, 2018, and the Primary will be held on August 28, 2018. Who is your favorite and how can you really tell what candidate is the best fit for Florida’s next governor in 2018”.” Florida’s’ next Governor will either be about money, and popularity. Or the Underdog Candidate, who has to use other means to garnish attention in a two-party election system. That as pre-2016 Presidential elections. GP7A News: Whereas millennials, are using their heads, Bernie Sander Voters realizing that Bernie Sanders has no relevance. No matter what the Bias, Fake news media tells us. And don’t be made at them. They are doing what everyone accuses Google of doing, (Not True) and manipulating content, to favor their candidates, or their hidden agendas. This is called politics. But this is old school politics. And the underground movement is moving along. voters, and the citizens who don’t vote? Does why does being the right man for the Governor. For all the right reasons, worth more than those candidates for governor of Florida for 2018 for all the wrong reasons. Because Adam Putnam is the establishment GOP. And though, Adam Putnam may be gaining money. Adam Putnam, not gaining any relevance, as to the best candidate. Voting for Adam Putnam will not move Florida. In the direction it needs to go to protect all Florida Voters. candidate. This is called “blind politics candidate support”. No matter what GOP Establishment first, and special interest 2nd, lobbyist, and media hounds 3rd. Citizens #1 during Florida’s s Elections … Never again. Will citizens come 1st. even their own parties, their voters are only #1 when it comes to elections cycles. Period. 100% Verified. Voters’ are Not looking for the most experience, but the best overall candidate. Millennials want Florida State Capitol to be on a different path come Jan. 1, 2019 What will Florida’s 2018 election for governor’s race look like ... Bipartisan Republican Candidate Bruce Nathan officially jumped into the governor’s race as Front runner. Did you know based on current conversations, not the conversations the pollsters, and other political strategist and their fake bias news. You can tell the bias media by the candidates they write about the most. Their predicted winners and losers. In the coming years. It's up to Florida voters to open their eyes. And pull together to protect the citizens of Florida, and their children, parents and the elderly. All across Florida. Florida’s Gubernatorial Elections will be the cross roads for either a new beginning, A candidate for all. Or the same old same old. Electing the same establishment, with the most money. And expecting a different result. GP7A News: Trending Is insanity voting. Because when the lights go out. We are all Floridians. Helping each other, regardless of color, creed, back ground. Florida has reached a point. And the positive beacon of light. And because one candidate will be excluded by those in the bias media supporting their candidates, (They have every right to be Bias, fake, with no regards to follow the standards of professional Journalism. with all their secret agenda’s hidden, within the money trail of from their donors’. Candidate Front Runner Governor Florida 2018 is Bruce Nathan. On Nov 2, 2017 1:13 Am Marcus Giavanni and GP7A News, reached out to Florida, and Florida's Gubernatorial Elections for 2018. We caught up with the Front Runner, Republican Candidate Bruce Nathan. And Why he wants to run for Governor's Race, on November 6, 2018, and the Primary Election will be held on August 28, 2018."." 2028 Governor 2018 Bruce Nathan is the New conversation with Millenials, and even Bernie Sanders Voters are voting Bruce Nathan. Did you know Bruce Nathan has healing hands? 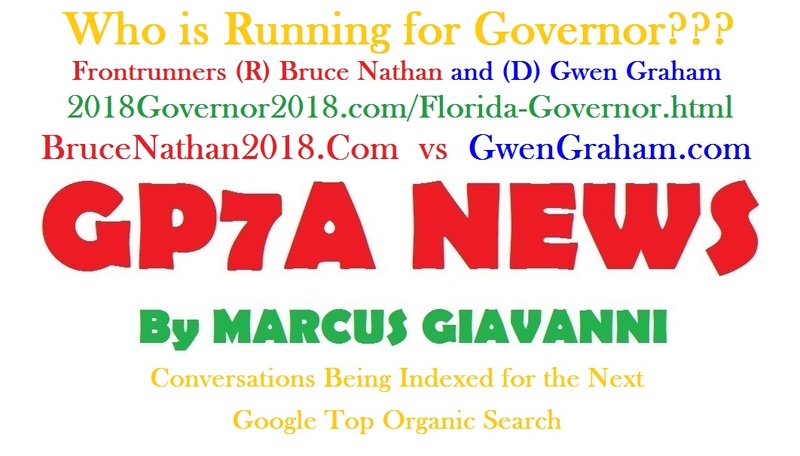 GP7A News: Trending news ... about Florida's innovation love and peace Governor 2018 Bruce Nathan. Will "Candidate Front Runner for Governor of Florida 2018" Bruce Nathan". Florida's Innovation Love and Peace Governor 2018 Father’s Rights, Health, State Power Nov 6, 2018 Election. Did you hear? "Bruce Nathan is Florida's Innovation Love and Peace Governor 2018", and Bruce Nathan is the go-to-Governor. Bruce Nathan 2018 "." See, Florida's Bruce Nathan for Governor in 2018"."